150 years ago 90% of the population farmed. The same industrial revolution that promised to “liberate” us from rural life and physical toil has created more problems than it has solved. Chemically-based methods, factory-farming, and GMO’s are compromising our health and environment. Additionally, the promise of mechanized agriculture to feed the world has fallen short. According to world hunger statistics, 842 million people are food insecure. On a global scale, women produce more than half of all the food that is grown. In sub-Saharan Africa and the Caribbean, they produce up to 80 percent of basic foodstuffs. In Asia, they provide from 50 to 90 percent of the labour for rice cultivation. In Southeast Asia and the Pacific as well as Latin America, women’s home gardens represent some of the most complex agricultural systems known. Women in the rural areas are almost exclusively responsible for the nutrition of their children, from gestation through weaning and throughout the critical period of growth. In addition, they are the principal food producers and preparers for the rest of the family. 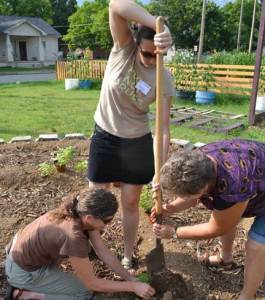 In general, most of this food comes from home gardens or from family and community plots. Work in the household is often considered to be part of a woman’s duties as wife and mother, rather than an occupation to be accounted for in the national economy. In most countries, women do not own the land they cultivate. When land is owned by women, it tends to be smaller, less valuable plots that are also overlooked in statistics. Women are usually responsible for the food crops destined for immediate consumption by the household, that is, for subsistence crops rather than cash crops. Extension services reach women much less frequently than they do men. Statistics indicate that women receive no more than 5 percent of extension resources. In 2013, 14 percent of households (17.5 million households) were food insecure. In 2013, 6 percent of households (6.8 million households) experienced very low food security. In 2013, households with children reported food insecurity at a significantly higher rate than those without children, 20 percent compared to 12 percent. In 2013, households that had higher rates of food insecurity than the national average included households with children (20%), especially households with children headed by single women (34%) or single men (23%), Black non-Hispanic households (26%) and Hispanic households (24%). In the US women are becoming more visible, at least in certain sectors, such as entertainment, news, and politics. And their power and influence are growing across sectors. Women are beginning to reengage in agriculture on different terms; as business owners, farmers, bloggers, activists, and health-conscious consumers. Part of the trend of the “new farmer” is the face of the young and of women. Women farmers have increased 30% between 2002 and 2007. Women have shown to be front-and-center in the conversations about our broken food system, about obesity, and about regional solutions. Often because they are serious. They want their families and schools to have healthy foods. They want economic justice and economic power. As farmers, home growers, pantry stockers, and family cooks, women need to be seen, celebrated, and encouraged. From Julia Child, Alice Waters, and Rachel Ray encouraging us back into the kitchen to Vedana Shiva encouraging us to reclaim agriculture. 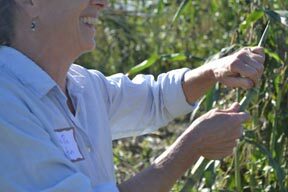 We believe that women are central, dynamic, and vital partners in the sustainable food movement. The number of food and farming engaged women is likely to soar over the next few years thus breaking the barrier of invisibility and leading the way for the rest of the world to follow. Women who enter farming often do so with a focus on diversity, sustainability, foodshed resilience and community. But what does it look like to get the average woman to reclaim cooking, pantry, and backyard wisdom? To incorporate food preparation into their lives? What will inspire women to desire food literacy and food sovereignty? To increase their skill and reduce their expenses by reengaging with the lost kitchen arts of food production, procurement, processing, and preparation. 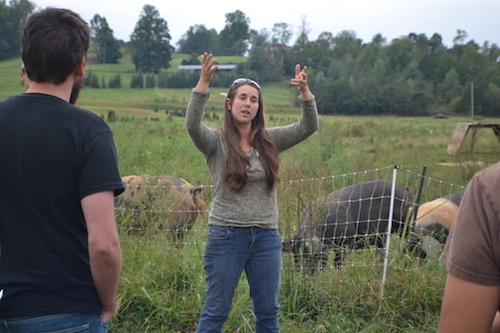 We need more of these food and agriculture engaged women at all levels, from the home cook to those women who take a seat at the political table in order to create a remade food system with economic justice and sustainable practices at the center. In short, we need an inspired people, repopulating their lives with food. And true inspiration usually comes from the tactile, messy, body-knowledge of personal experience. Maybe the answer, again, lies in education. And celebration. One model we love is the up-and-coming Plate to Politics project, a new collaborative effort by the Midwest Organic and Sustainable Education Service (MOSES) Rural Women’s Project and Women, Food and Agriculture Network (WFAN). Plate to Politics(SM) is a nationwide effort to support and strengthen the national leadership role of women transforming our nation’s food system, from the federal agriculture policy agenda to what’s on our family’s supper plate. This is an outstanding example of education, celebration, support, and inspiration. Share more ideas with us.